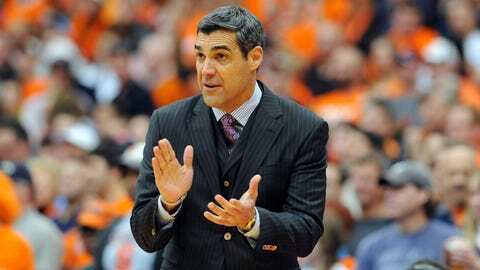 Villanova head coach Jay Wright has his Wildcats at 11-1 and in first place in the new Big East. As the new-look Big East opens conference play Tuesday, many are questioning the quality of the league after its teams went 5-19 against the RPI’s top 50 teams in nonconference play. Only one team was ranked in the preseason poll and just one currently finds itself in the polls. But what may make the inaugural season of the revamped Big East exciting is how wide open the conference is. Villanova will go in as the clear favorite, but anywhere from five to seven other schools have a chance to make the NCAA tournament with a strong conference season. The Big East is shaping up to be a four- or five-bid league at most, meaning conference play is going to be crucial in deciding who goes to the NCAA tournament. Here’s how Fox Sports Wisconsin’s Andrew Gruman sees the rest of the conference right now, from best to worst. Outlook: Picked in the preseason to finish fourth in the Big East, Villanova is currently the only ranked team in the conference heading into league play. The Wildcats burst into the rankings after winning the Battle 4 Atlantis, beating USC, Kansas and Iowa on consecutive days. Villanova started 11-0 before falling Saturday at No. 2 Syracuse. Senior guard James Bell has jumped from 8.6 points per game a year ago to 16.2 this season, pacing a Wildcats offense second in the Big East at 80.8 points per game. Junior forward JayVaughn Pinkston (15.3 points per game) and junior guard Darrun Hilliard (13.6) also average double figures. Freshman guard Josh Hart has become an instant contributor off the bench. The Wildcats aren’t the best-shooting team in the league, but they put up a lot of 3-pointers and force the most turnovers in the Big East. Villanova has two of the Big East’s five wins over the RPI’s Top 50, leaving the rest of the league just 3-17. The Wildcats have clearly had the best nonconference season of the 10 teams and enter conference play as league favorites. Barring a big collapse, Villanova is an NCAA tournament team. The question facing the Wildcats is just how good are they on a national level? Outlook: Creighton had a solid nonconference slate, winning four games against the RPI’s Top 100 and not having any bad losses. That said, the Bluejays don’t have a great nonconference victory. San Diego State and George Washington have turned out to be very good teams, and it’s possible Creighton could wish it had one or both of those wins come March. Led by two-time All-American Doug McDermott, Creighton’s offense tops the Big East in scoring at 82.9 points per game. McDermott is averaging 24.8 points and 7.3 rebounds per game while shooting 49.0 percent from the field. The Bluejays are one of the best-shooting teams in the nation, especially from beyond the arc. Creighton is third in the country in both 3-pointers made per game and 3-point percentage. There are some areas in which the Bluejays must get better in order to win a league title, particularly offensive rebounding and creating turnovers. Creighton grabs the fewest offensive rebounds in the Big East and while the Bluejays don’t turn the ball over much, they have the fewest steals in the league and force the fewest turnovers. Outlook: Much like Creighton, Georgetown doesn’t have a great win. But the Hoyas do have a bad loss, falling to Northeastern in the Puerto Rico Tip-Off. The talent is there for Georgetown to win the Big East, as D’Vauntes Smith-Rivera and Markel Starks lead a high-scoring backcourt. Georgetown’s X-factor may be UCLA transfer Joshua Smith, who leads the conference in field-goal percentage at 69.3. Ruled eligible prior to the start of the season, the 350-pound center is talented but has his share of issues, mostly related to his weight and stamina. Where Smith struggles the most on the court is one of Georgetown’s biggest weaknesses: rebounding. The Hoyas are 201st in the nation in rebounds per game and last in the Big East in rebounding margin. Georgetown also has struggled defensively against the better teams it has faced, an obvious concern moving forward. Like many in the league, Georgetown has a lot to prove before it can be considered a safe bet to make the NCAA tournament. But the Hoyas are one of the teams that can save the conference’s image in its inaugural year. Outlook: It’s crazy to think Butler was picked to finish ninth in the league, but the Bulldogs did have a lot of unknowns heading into the Big East. Brad Stevens left for the NBA, leaving Brandon Miller as a first-year head coach. Roosevelt Jones, the team’s leading returning scorer, tore ligaments in his wrist on a summer trip and was ruled out for the year before the season even started. With Rotnei Clarke and Andrew Smith graduated and Jones out, Butler needed a couple of guys to establish themselves as scorers. Kellen Dunham and Khyle Marshall have done just that. A 6-foot-6 sophomore, Dunham has doubled his points per game output from 9.5 as a freshman to 18.1 and is one of the best 3-point shooters in the league. A role player for his first three years, Marshall has taken the next step as a senior, averaging 17.0 points and 6.7 rebounds per game. The Bulldogs don’t have the size they had a year ago, as Kameron Woods at 6-foot-9 is Butler’s tallest player in the rotation. Miller is a Butler guy and has continued what those around the program call "The Butler Way." It shouldn’t be surprising that the Bulldogs have exceeded expectations and are in position to earn an NCAA tournament bid with a strong conference season. Outlook: This is where the rankings begin to get difficult. The next four teams all could be placed anywhere from fifth to eighth. Xavier gets the nod for the fifth spot because of the quality of its three wins over the RPI’s Top 11. A spanking of rival Cincinnati is the highlight win, but a split of two games against Tennessee and a win over potential bubble team Wake Forest all will help later in the year. While USC isn’t a bad loss based on its current RPI, the Trojans are a team expected to finish at the bottom of the Pac-12. Sophomore Semaj Christon was expected to be Xavier’s star, and he has been just fine although his scoring average is down from 15.2 in his freshman year to 14.7 this season. Transfer Matt Stainbrook has given the Musketeers an inside presence, while three others provide balance at over 8.0 points per game. Xavier is one of the best defensive and rebounding teams in the Big East and will find itself in a lot of grind-it-out games in league play. Will the Musketeers score enough points? They can help boost that number by making free throws. Xavier is the worst free-throw shooting team in the conference at 63.6 percent. This is yet another team in position to make the NCAA tournament that needs a strong showing in the next two months. Outlook: Picked to win the conference in the preseason, Marquette is considered by some to be the Big East’s biggest disappointment. Sure, the Golden Eagles can’t be pleased with their 8-5 record, but it’s really not that surprising. With Vander Blue shocking everyone to leave school early to go undrafted, Marquette had a lot of question marks heading into what was a very difficult nonconference schedule. Nobody in the Big East played a tougher schedule thus far than the Golden Eagles, as Marquette played six teams likely to make the NCAA tournament. Only the Ohio State game was a rout. The Golden Eagles competed on the road at Wisconsin, in what really were road games against San Diego State in Anaheim and New Mexico in Las Vegas and in another road game at Arizona State. Competing and staying close with good teams is nice, but Marquette didn’t win any of those. A rout of George Washington in Fullerton has turned into one of the Big East’s best wins, however. Consistency is what Buzz Williams needs to see moving forward. Marquette still can win the league, and it can still extend its NCAA tournament streak. But the Golden Eagles need guys to step up. Davante Gardner and Jamil Wilson have to be the team’s go-to scorers and others need to find their roles. Marquette is the best defensive team in the league, but it’s going to need to be much better offensively to contend. Outlook: The Friars have been close to two really big wins, only to fall just short late. Providence hung with Kentucky into the second half and lost on the road to a very good Massachusetts team on a tip-in with 1.1 seconds left in overtime. Providence hasn’t been good enough offensively thus far, last in the league in scoring offense at 72.2 points per game and last in field goal percentage at 41.3. Bryce Cotton is scoring in high volumes at 19.5 points per game, but he’s shooting just 39.9 percent. Sophomore transfer Tyler Harris, brother of former Bucks forward Tobias Harris, has immediately made an impact at 13.8 points and 5.2 rebounds per game. Kadeem Batts and LaDontae Henton haven’t been bad, but Providence is going to need more from them to make an NCAA tournament push. The biggest blow suffered this season was the lost of talented sophomore point guard Kris Dunn for the year. Dunn, the top point-guard recruit in the class of 2012, underwent his second shoulder surgery in 18 months in December and will apply for a medical redshirt. Providence is left without a true point guard and not a lot of depth at guard. Outlook: It’s been the same story yet again for St. John’s. The Red Storm are talented enough to beat anybody but they just haven’t proven it. St. John’s almost sprung a major upset of Syracuse at Madison Square Garden but fell late. A bad first half set the Red Storm back in a neutral court game against Wisconsin to open the season, while a loss in Brooklyn to Penn State has to sting. D’Angelo Harrison is one of the Big East’s best players, scoring 19.5 points per game, but he needs help. Sophomore forward Jakarr Sampson and junior guard Phil Greene IV haven’t taken the next step, while preseason Big East freshman of the year Rysheed Jordan hasn’t made the expected impact. There’s no question St. John’s is talented enough to make noise in the Big East and make the NCAA tournament, but it’s time to prove it. Outlook: Injuries have been the story with Kevin Willard’s team for the second year in a row. Five key players have missed time with various ailments, leaving Willard having to alter practices because of a lack of bodies. Fuquan Edwin has battled a sprained ankle, an injury that may be to blame for his drop from 16.5 points per game last year to 13.0 this season. Texas transfer Sterling Gibbs leads Seton Hall in scoring at 15.9 points per game, but he recently missed a game with a hyperextended right knee. The scariest injury came last Friday when senior center Eugene Teague suffered a severe concussion after falling directly on his head. He’s currently out indefinitely. Injuries certainly have hurt, but losses to Mercer, Fairleigh Dickinson and St. Peter’s are hard to excuse. Seton Hall can score, but it can’t stop anyone, especially on the perimeter. The Pirates are at the bottom of the Big East in almost every statistical category and could be in for another difficult season. Outlook: Picked to finish last in the Big East, DePaul has done nothing to prove it won’t finish in the basement yet again. The Blue Demons don’t have a quality win, as their best victory is over Milwaukee. DePaul fell at home to Southern Miss, suffered a bad loss at Illinois Sate, was routed at home by Arizona State and blown out on a neutral court by Texas and Wichita State. The Blue Demons needed overtime on Dec. 15 to survive against a bad Chicago State team. Cleveland Melvin and Brandon Young have continued their strong careers for DePaul, while freshmen Billy Garrett Jr. and Tommy Harrington IV have made a decent early impact. The Blue Demons just haven’t gotten much out of anyone else on their roster. DePaul is seventh in the Big East in scoring offense and last in scoring defense, not a good combination. Turnovers have been a major problem, as the Blue Demons average 14.1 per game and don’t make up for their miscues with a high assist total. There’s just not enough there to see DePaul finishing anywhere but near the bottom, a trend Oliver Purnell can’t seem to buck.